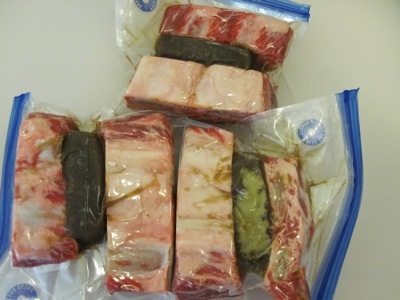 cookbook, a technique that requires a long soak in the sous vide hot tub. Before committing to Chang’s recipe and possibly ruining good short ribs, I thought a test run was in order. I had a pint of braising liquid in the freezer left over from the Ad Hoc Braised Beef Short Ribs, all I needed was some inexpensive meat to work with. 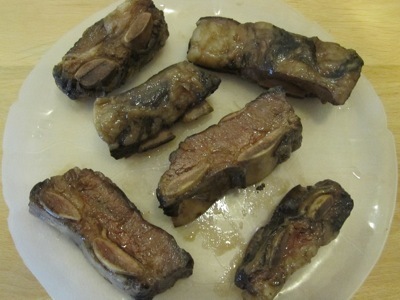 A quick run to Casa De Carnes Solucao, my local Brazilian butcher, turned up a nice slab of beef ribs. The cut was different, more of a thick flanken (or Korean) style cut, bu they were more than adequate for the test. 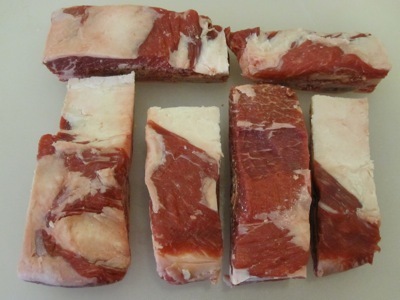 I trimmed the excess fat and silverskin, and split the cuts into two-bone segments. Because I don’t have a professional chamber vacuum, I had to figure out a way to incorporate the braising liquid into the sous vide bags without having it sucked out by my vacuum sealer. 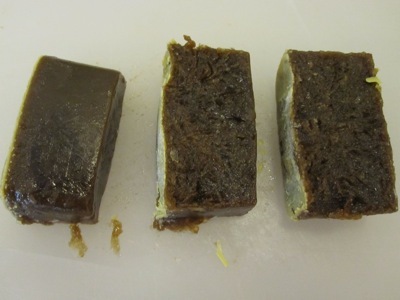 My solution was to cut the still-frozen liquid into three slabs. I sandwiched a slab of liquid between two ribs in each bag, then applied the vacuum. I placed each bag inside a larger vacuum bag (in case the inner bag broke, I wouldn’t wind up with sous vide soup) then dropped the bags into the water bath, where they would cook at 60 °C for the next two days. Like the steaks I had tried previously, the ribs were still pink in the center. I removed the bones and cut away the cartilage which would have dissolved over the course of a traditional higher-heat braise. I poured the braising liquid into a pan, set it to simmer, and added the ribs to bring them up to a warmer serving temperature. 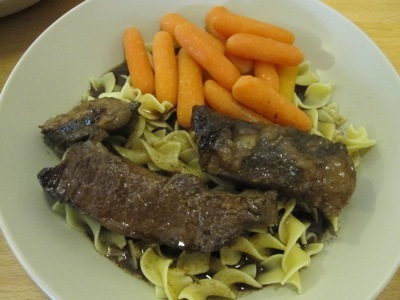 I plated the ribs over buttered noodles with a side of butter-braised baby carrots. Unlike short ribs prepared by the standard these weren’t the fork-tender shred-apart ribs I am used to. These were meltingly tender but maintained their shape, requiring a knife to cut. The beefy flavor was much more to the forefront, a welcome contrast to the fatty exterior and rich sauce. Now that I know the method works, I’ll be moving on to Chang’s recipe soon.